I was somewhat surprised by Opera Atelier’s decision to mount Purcell’s Dido and Aeneas as their fall 2016 production. From start to finish, this opera is about an hour long, and most opera goers are looking for more than an hour worth of bang for their buck. 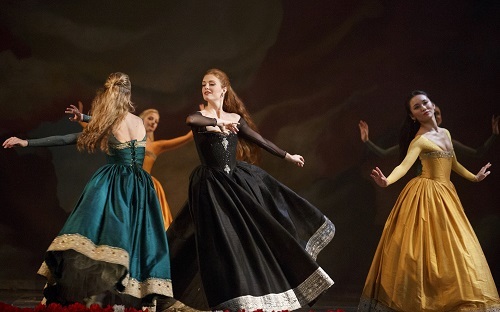 Opera Atelier mounts historically informed productions of opera from the 17th and 18th centuries. Their productions are always exceptionally well-researched, and Dido and Aeneas was the very first opera the company ever mounted, in 1985. Artistic Director Marshall Pynkoski and Choreographer Jeannette Lajeunesse Zingg took advantage of their extensive knowledge of this work to craft a full evening’s entertainment. The story draws from the Aeneid by Virgil, and does not take very long to tell. Aeneas is unexpectedly shipwrecked in Carthage. There, he meets and romances the beautiful queen, Dido. To satisfy a general malice towards all prosperous humans an evil sorceress and her witches conspire to destroy the couple’s happiness. They convince Aeneas that he must return home, and upon his departure, Dido kills herself. The opera is very early, it is believed to have premiered in the 1680s. The libretto indicates that there should be a prologue and several dances, however the music for these does not survive in the existing score. Ballet dancing is one of the most distinctive and remarkable aspects of Opera Atelier’s productions, making Dido and Aeneas an excellent vehicle for the creativity of Pynkoski and Zingg. Theatrical music by Purcell was used as the accompaniment for several elegant dances. The prologue from the original libretto opened the performance. The monologue (performed by Irene Poole) was accompanied with music by Marin Marais, a contemporary of Purcell. The libretto assumes knowledge of the story because the Aeneid would have been common knowledge for opera-goers in Purcell’s day. The prologue is intended to shed light on the back story. I question how effective it is in this regard because it is in 17th century English, and also assumes knowledge of Greek Mythology. Regardless of how well the nitty gritty of the monologue was understood, it was powerfully and compelling delivered by Ms. Poole. This production was much more minimalist than Atelier’s usual offerings. The ethos of the production seemed to be straightforward story-telling, without any unnecessary frills. The costumes for the women ballet dancers were striking for their use of rich, high-intensity pigment, and simple lines. The motif of vibrant colour and simple lines was repeated in the set, and the story required minimal use of props. All of the vocal performances were delightful and Wallis Giunta was stunning in the title role. While I would be happy to hear any of these singers any day of the week, this production did not quite reel me in. The narrative happens fairly quickly, and does not allow much time for character development. As an independent, educated woman of the twenty-first century, Dido is hard to relate to. In the modern day, suicide seems an overreaction to your boyfriend of a few days leaving you. While I do not think this is the finest example of Atelier’s work, this production is a great choice for people who are curious about opera, but who do not want to commit to three to five hours in the theatre. Dido and Aeneas is a tried and true operatic standard, and the beauty of the music has been undisputed for over three centuries. Show times are 7:30 PM on October 25 & 28; with an additional matinee at 4:30 PM on October 29.